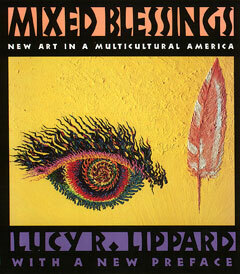 The New Press is proud to publish a new paperback edition of Mixed Blessings, the first book to discuss the cross-cultural process taking place in the work of contemporary Latino, Native, African, and Asian American artists. Rich with illustrations of artworks in many different media, and filled with incisive quotes and unsettling reports, it is more than a book about art; it is a complex meditation on the relationships of people to their cultures. Lucy R. Lippard, one of our most original and insightful writers on art, challenges conventional approaches and explores the role of images in a changing society. Among her subjects are the uncertainty of exile; the confusion of identity in attempts to climb out of the melting pot; and art that speaks for itself, reversing stereotypes and reclaiming history and memory. The New Press edition features a new introduction by Lippard that reconsiders the issues first presented in Mixed Blessings when it appeared in 1990 and evaluates the state of multicultural art today.